Immediately after the terrorist attacks on America on September 11, 2001, the US government launched a communications strategy to change how people in the Arab world view Americans. It involved creating media in Arabic targeting mainstream Arabs and Muslims. Despite the continuing violence in the Middle East and the anti-American rhetoric from pockets of influential Arab and Muslim fanatics, it has largely been successful. The “Arab Spring” was driven as much by the Arab desire to embrace Western democracy as it was driven by the desire to be free. Even more, more people in the Arab world have turned to Western Internet resources and services and social media, rather than allowing homegrown Middle East web sites to dominate. Strengthening this American push to change how Arabs and Muslims view Americans was the push by the mainstream news media in America to expand their influence by building schools and supporting media programs in Arab countries like Dubai, Jordan and Egypt. If the Americans saw how important it was to spend hundreds of millions of dollars to change how Arabs and Muslims view America, why haven’t Arabs and Muslims done the same to change how Americans view them? In recent years, the media in the Arab and Muslim world has changed. Whereas years ago the media was completely dominated by governments, today many independent media outlets, including some on the extremist fringe, have surfaced offering a wider balance. A few of these new Arab media, including AlJazeera, have succeeded in “reaching” American audiences. Although AlJazeera purchased former Vice President Al Gore’s “Current TV” channel, which was popular and broadcast across the American mainstream, the new AJAM (Aljazeera America) which launched earlier this year as a 24-hour, full-time news broadcast has so far failed to make an impact on Americans. Early ratings show its audience is negligible, consisting most likely of those who already turn to Aljazeera and other Arab world media for information. Why haven’t business and political elites in the Middle East sought to change the anti-Arab and anti-Muslim views of mainstream Americans by launching successful media in America? It’s a question that traces back to Arab and Muslim culture, which has been forged by centuries of oppression, tyranny and occupation. These have been environments which discourage average citizens or the Arab street and Muslim street from expressing their views fully. Instead, Arabs and Muslims have been conditioned to avoid opinions that might be construed as critical of the governments or regimes that control them. As a consequence, Arabs and Muslims are lacking a deep-seated tradition of unrestrained communications experience and training. They recognize how much they “dislike” the Western media but they have consistently failed to recognize how easily they could engage that same media and change its outcomes and messages. This “media deficit” in the Arab and Muslim world manifests itself in many ways even among the new media we see rising in the Arab and Muslim world. Today’s Arab and Muslim media sees itself as fighting against old traditions of censorship and self-censorship (the act of avoiding reporting something that they know would result in punitive responses from governments or power elites). They pull their punches. They dilute their power. The 24-hour AJAM television broadcasts, for example, are filled with non-Arab and non-Muslim focused news stories. Most of these have already been broadcast elsewhere. The substantive core of AJAM, however, their advantage in reporting on the Middle East as an indigenous media, is often diluted, softened and edited so as “not to offend” American audiences. That’s because America has been conditioned by an unchallenged campaign to depict the Arab media as accomplices to terrorism and as anti-American propaganda fronts. Despite these shortcomings in the mainstream Arab and Muslim worlds, there are pockets of media success, but not in a good way. This past week, the Western media was bombarded by a carefully constructed propaganda assault from supporters of the terrorist group Al-Shabaab. Members of Al-Shabaab attacked a shopping mall in Nairobi, Kenya this past week, massacring dozens of innocent civilians. In some cases, the terrorists focused their misguided hatred against Western and non-Muslim targets. To counter the expected Western media coverage that not only attacked Al-Shabaab but also used the terrorist act to further aggravate the Western fears of anything Muslim, Arab or Middle Eastern, Al-Shabaab activists who clearly have a mastery of the English language, emailed press releases and used Twitter to get their message out to the public. I’m not saying they were effective in convincing any Americans that their massacre of civilians was justified. But they clearly showed that they better understand the fundamentals of Western strategic communications, confusing the public messages and creating counterbalance messages. More successful was Syria’s dictator Bashar Al-Assad, whose government and allies have been implicated in dozens of terrorist attacks across the world including the murder of Lebanese Prime Minister Rafik Hariri, other Lebanese journalists, and moderate Arab activists. Assad spent millions of stolen money to demonstrate that a professional media strategy can even undermine the power of American propaganda. President Barack Obama’s efforts to punish Assad for his use of chemical weapons to massacre 1,429 civilians in a Damascus suburb stronghold of the rebellion was stymied by very effective communications pushback from Assad coordinated with Russia and also pro-Assad and pro-Hezbollah activists in the United States. 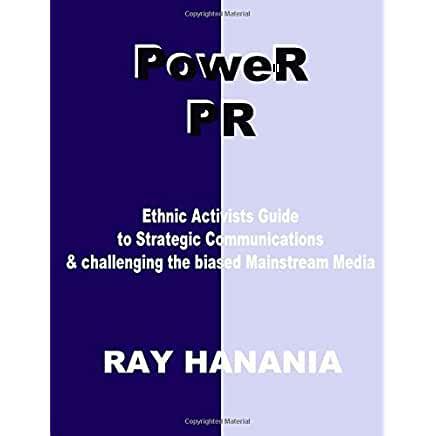 So why haven’t moderate Arab governments or prominent Arab and Muslim organizations directed resources into funding strategic media communications? They are too busy living in the traditional past. What the moderate Arab world needs to do is purchase a major national American newspaper – several of them are up on the auction block – and hire American Arab journalism professionals to man key positions in the media network, not outsource the jobs to non-Arab and non-Muslim Western media mercenaries. They could purchase or create a national radio network, and instead of trying to make Americans happy, as AJAM is trying to do, provide professional news reports based on facts and accuracy that challenge the fundamental anti-Arab biases of the West. It’s an easy thing to do. Maybe that’s why the Arab world is not doing it. THIS POST HAS BEEN READ 3927 TIMES SO FAR. THANK YOU!